This Unit is intended for 2 or 3 hours work with about 5 year old kids. Yet you may decide to do something different with it so please look carefully at what is included to find out if it will work for you. 2. An emergent reader – 6 pages long “Facts about Worms” + Flash cards with Sight Words and vocabulary used. 4. Worksheet 2 – draw where I live and where worms live – kids draw what’s under and above ground. 5. 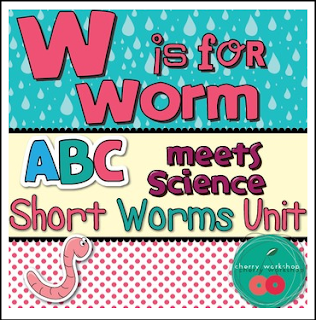 A board game “Happy Worm, Sad Worm”– the aim of the game is to practice letter recognition – kids should collect the letters to spell the words – WORM, RAIN, SOIL. During the game we also talk about what worms like to don’t like (rain, sun) and why. 7. Playdough Mat - for the letter W.